Like most people, I vaguely remember diminutive actor Danny DeVito showing up on The View blitzed out of his gourd a couple of years ago. Along with completely ruining "It's Always Sunny in Philadelphia" it has been the only newsworthy event in his career in the past decade. DeVito blamed the intoxication on drinking Limoncello with George Clooney. According to Wikipedia it is a is a lemon liqueur from Southern Italy made from lemon rinds, water, sugar and alcohol. If you think this sounds like a moron could make this, then you're right. 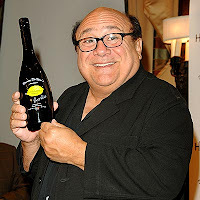 Danny DeVito's Premium Limoncello has been on the market for two years. Have I been living on another planet all this time? Along with destroying a television show, DeVito has singlehandedly killed the idea that "Premium" & "Italian Product" should be in the same sentence. While some may put this douchebaggery in the same category as Dan Ackroyd and Vodka, I see a new category for celebrity endorsements. Simply take the most embarassing moment in your career add a product that capitalizes on the scandal and that equals instant moolah. Think of Chris Brown endorsing text messaging plans or Tom Cruise could endorse couches. Someone like R. Kelly could really help adult diapers find a new market. Everyday brings another scandal that can be exploited for monetary gains. I'm waiting for your call Lindsay Lohan.